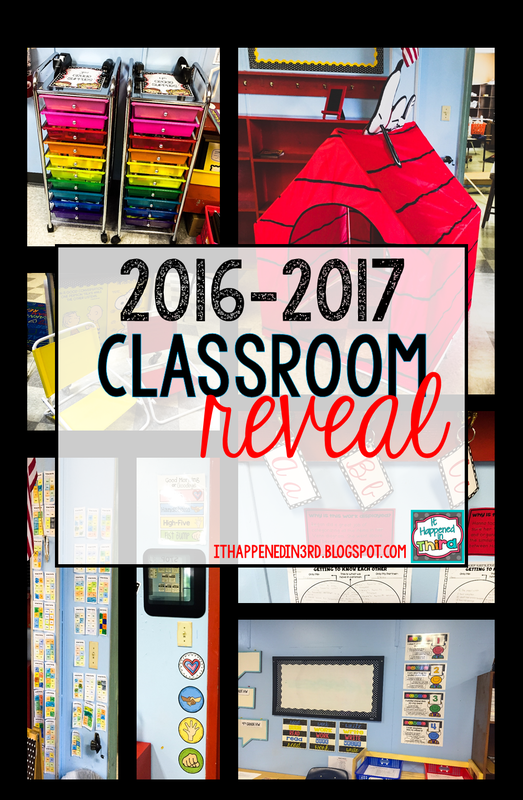 It's been a busy start to the year, but I've finally had time to sit down and write my Classroom Reveal post! 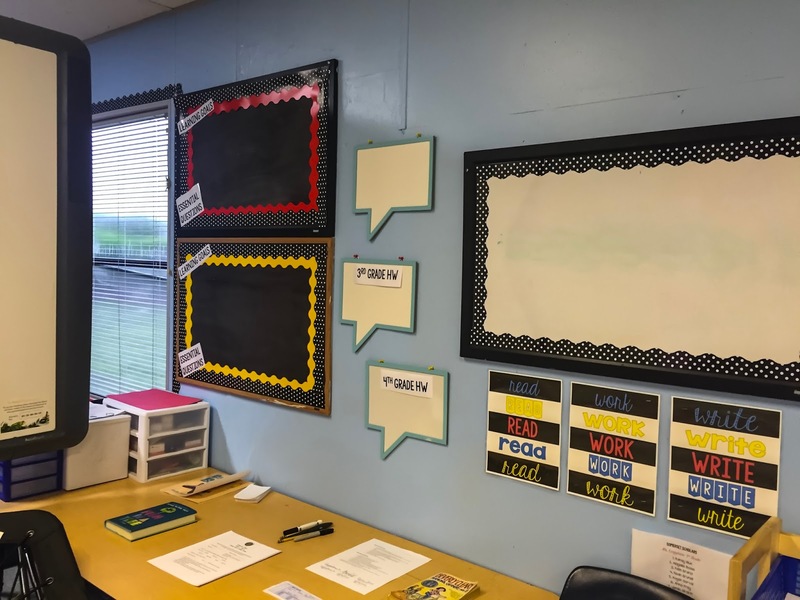 Over the past 13 years I have changed grades, rooms, and themes more times than I can count, but I can say with absolute certainty that this is my favorite classroom setup ever. First of all, the wall color makes my heart happy! In addition, I think I struck that perfect mix...the room is 100% "me" and showcases my personality (I mean, I spend half my day there, so it should suit my tastes!) but at the same time it is completely student-friendly. They can move about and get what they need without any assistance, and I tried my best to make all my displays things they can refer to as the year goes on. That being said...sit back, relax, and enjoy the tour! Here's kind of a full view of our working area. Student seating options are stored out of view behind me. 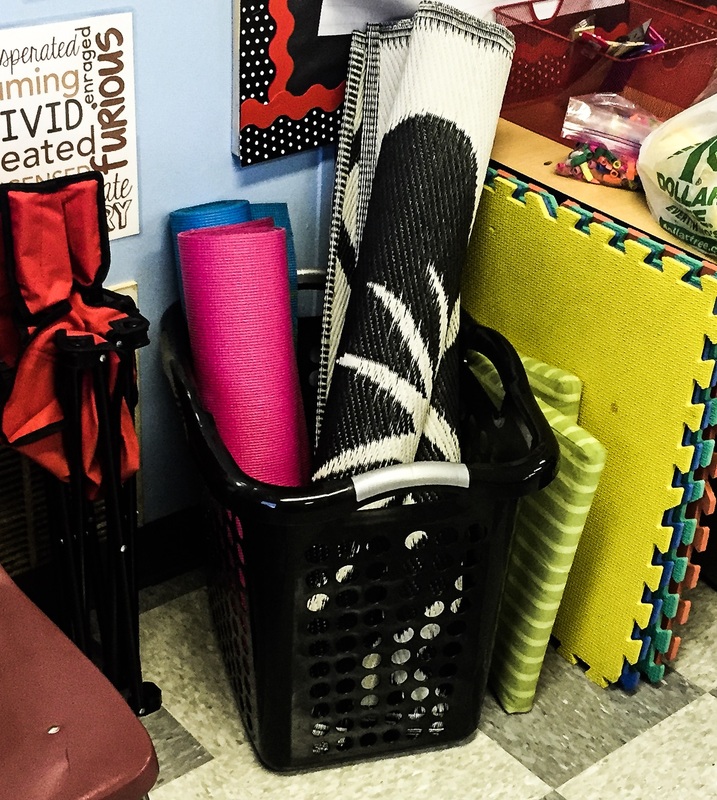 I was going to gradually introduce flexible seating, but I knew I had an awesome bunch of kids coming to me so I just decided to dive in head first. Best decision I've ever made! 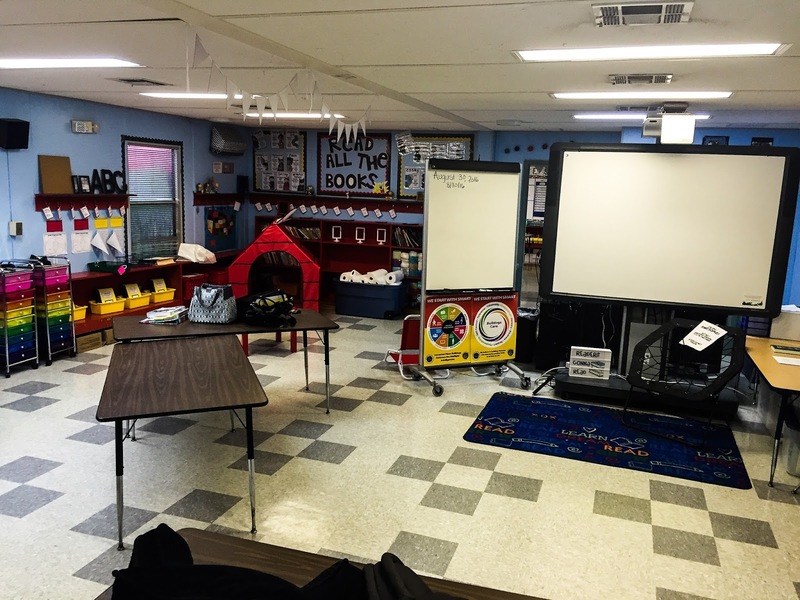 In this picture you can see our meeting area, the library (far corner), and 4th grade's journals and textbooks (in the yellow tubs...the 3rd graders keep their stuff on the other side of the room in red tubs). 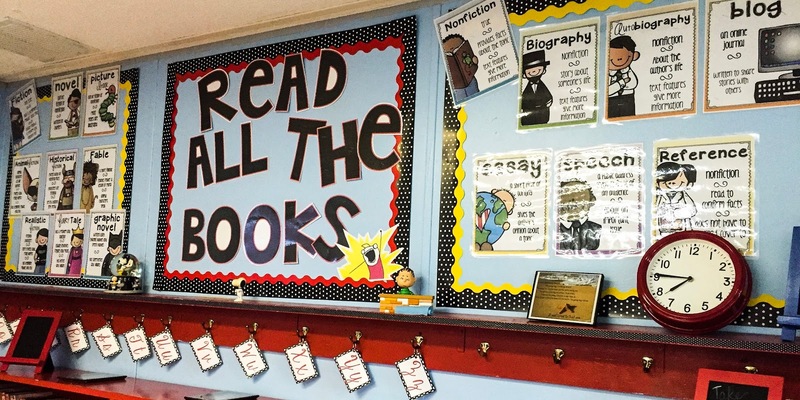 I try to separate the 3rd and 4th graders' things as much as possible to keep things nice and organized! Closer view of the meeting area. We start each class period here and then transition into our seating choices for the day. This prevents chaos and fights over cushions! As of right now only I am allowed in the bungee chair (it will become a prize in our 3rd vs 4th AR challenge!) so there is a sign on it to remind them not to touch. When I was setting up my room, I received a lot of comments on where I placed my Promethean. I figured that it's on wheels so I can put it wherever I want...and I wasn't about to give up 5 feet of valuable wall space if I didn't have to! Yes, it does block my desk, but I don't sit at my desk during the day anyway. 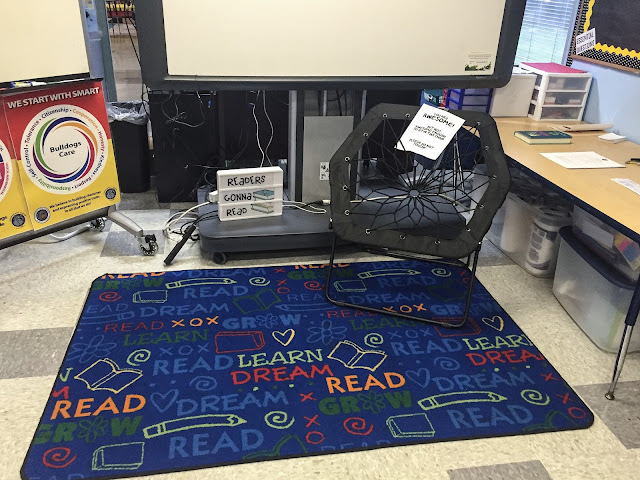 If I'm in the middle of a lesson and I need to do something on the computer, one of my "teaching assistants" (a job in my class) has permission to go to my desk and navigate. 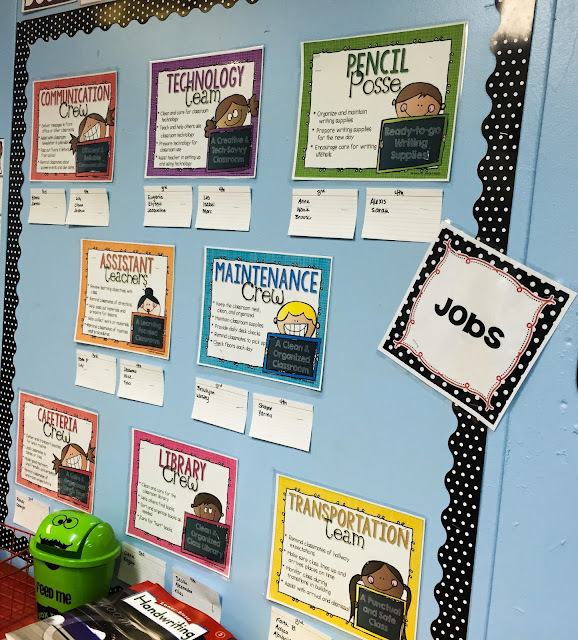 Speaking of jobs, I am using Teacher Traps's Classroom Crews this year and love it!!! Students applied for jobs at the beginning of the year and will keep them for a month. Then they will apply again for a new position. I love how the students have to work together as a team, and I get a kick out of how seriously they take their jobs! I'm so glad I invested in these carts (when Michaels was having a 50% off sale!) because they have become game changers in my class. Each grade level has a cart, and everything they use has a place in the cart. My favorite part of using these carts is the pencil management. 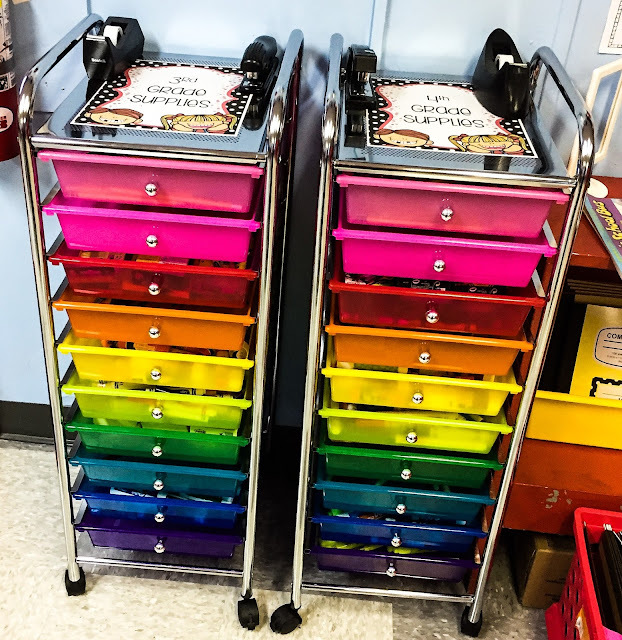 When students come in, they get a pencil from the top compartment. At the end of the day, they place those used pencils in the 2nd compartment and the "Pencil Posse" (part of the Job Crews) sharpens them and replaces erasers as necessary. The top compartment is filled with hundreds of pencils so we spend absolutely 0% of class time looking for pencils or sharpening pencils. Oh, how I wish I had thought of this sooner! Here's another way we stay organized without desks. Each student has a cubby that corresponds with their class number. In the morning, the 3rd graders take everything they want from their backpack (water, jackets, lunch, personal books, etc.) and place it into their cubby. 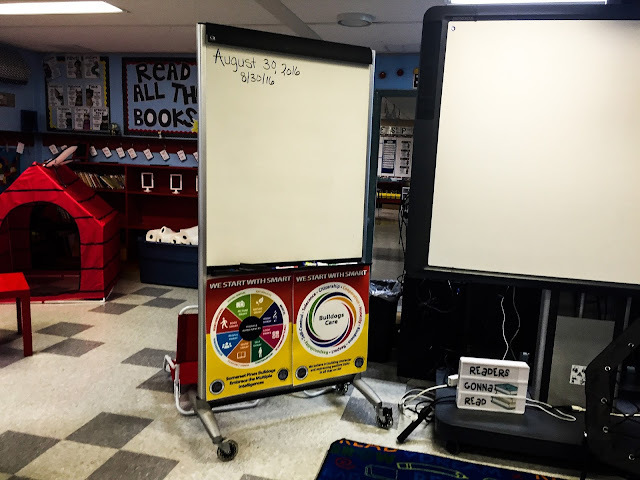 They also have a clipboard that they use as they move throughout the room during the day. When the 3rd graders get ready to leave, they must empty their cubby of everything except the clipboard. 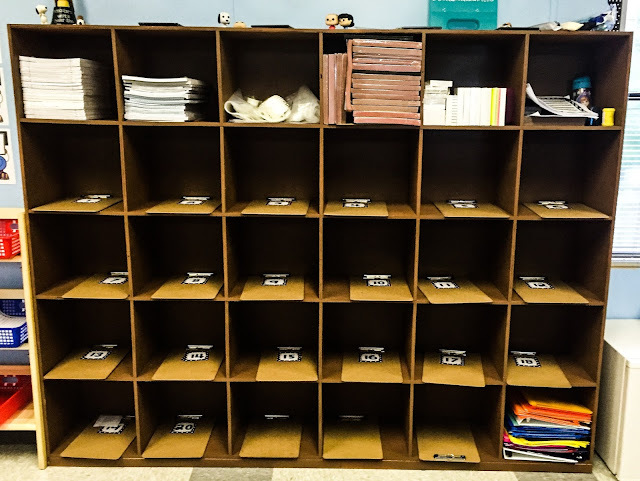 When we switch with the 4th graders, they follow the same routine and make sure they leave their cubbies empty at the end of the day. I absolutely love this because there's no constantly going into backpacks, and I'm able to see everything they place in their cubbies...no trying to hide things! Before each group leaves, the "Maintenance Team" checks to make sure the cubbies are clean. Simple, but effective...just the way I like it! I keep all my mats rolled up and stored in a large laundry basket. We also have some folding chairs, cushions, and stools for student use. For the most part, the students don't have an issue with choosing something to sit on and getting to work. If there is an argument, I randomly select a student on Class Dojo. That student picks a seating option first, and then it goes in alphabetical order from that student. 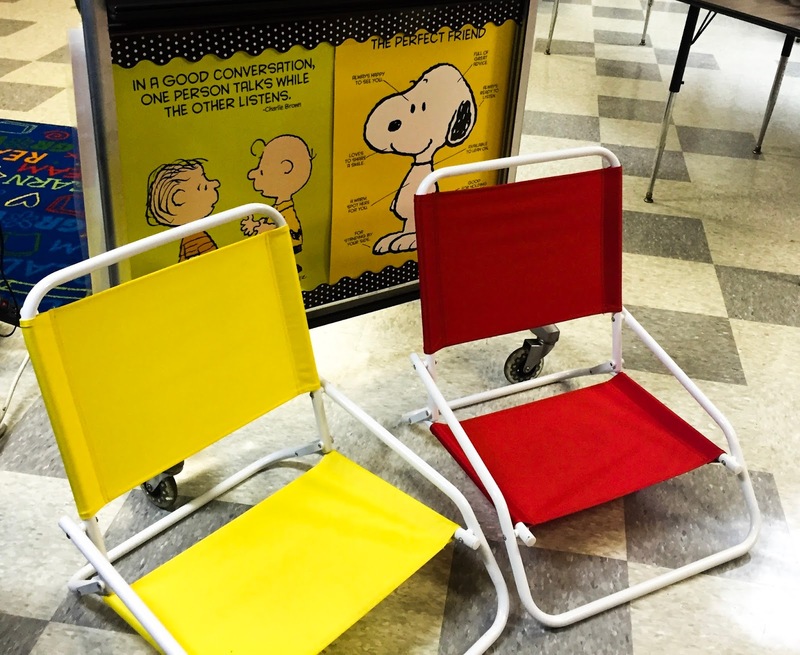 Students love these folding chairs...I got them at Target! Here's the "Information Station." Essential questions, important info, things students need to copy into their planner...it all goes here. I also keep all my lesson materials for the day on this table. 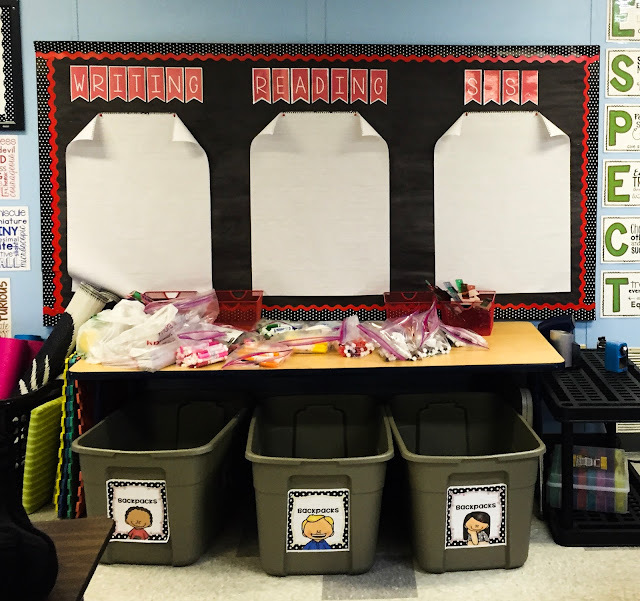 Here's another view...you can see our Levels of Understanding and the baskets where I keep copies for the week's lessons for both 3rd and 4th grade. 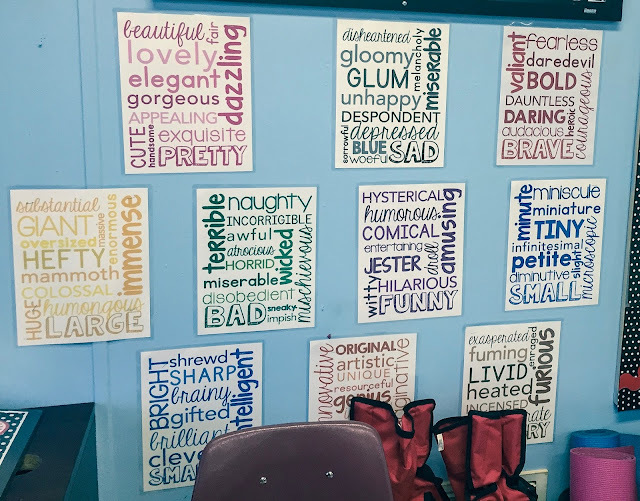 My students love this Synonym Subway Art I got from Catherine Reed's store. We referred to these posters a lot during out character unit! 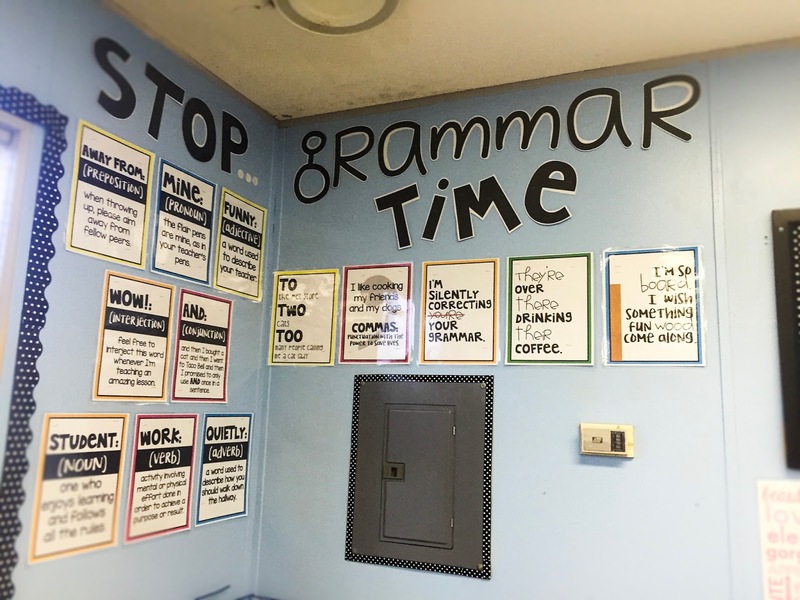 ...and I absolutely LOVE this grammar poster set from Teaching and So Fourth! This is my anchor chart area. 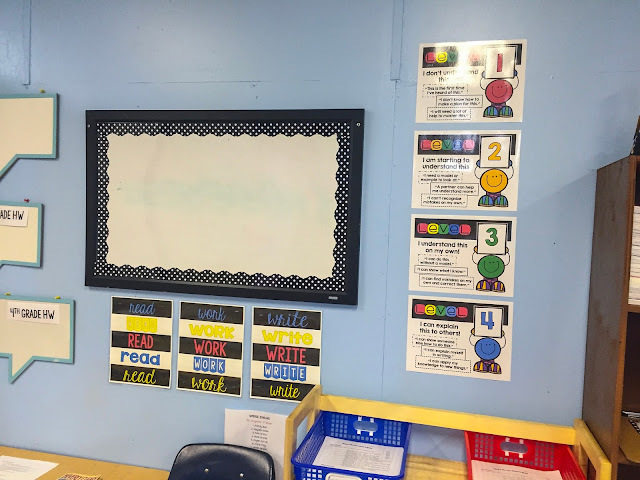 I just use pushpins to hang them up so they can easily be changed out depending on if I have 3rd or 4th grade in the room. Underneath that is where students store their backpacks. To the right you see our rules. We use the RESPECT acronym posters from Digital Divide and Conquer as guidelines on how to have a great day! Here's a closer look. 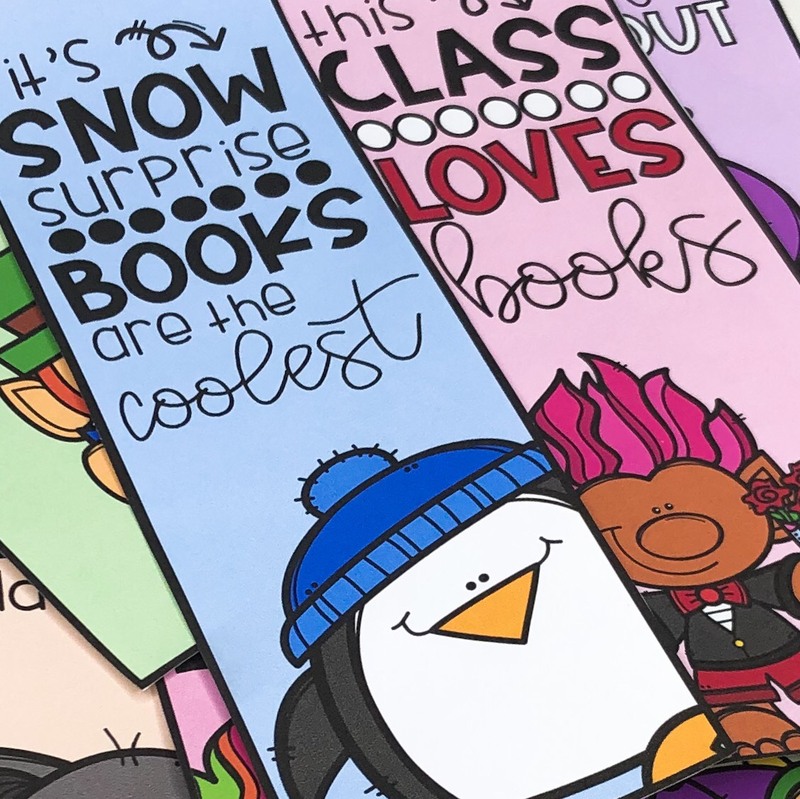 These are great if you have a group that doesn't need the traditional "Raise Your Hand to Speak" type of rules! This is my favorite part of the room! I have the Tattooed Teacher's Genre Posters separated by fiction and nonfiction genres, as well as a friendly reminder to my students of what they should be doing while they're in my room. :) Hyperbole and a Half is one of my favorite things on the web ever, so I needed to put a little shoutout to the comics up there! Of course, the library isn't complete without Snoopy's doghouse. 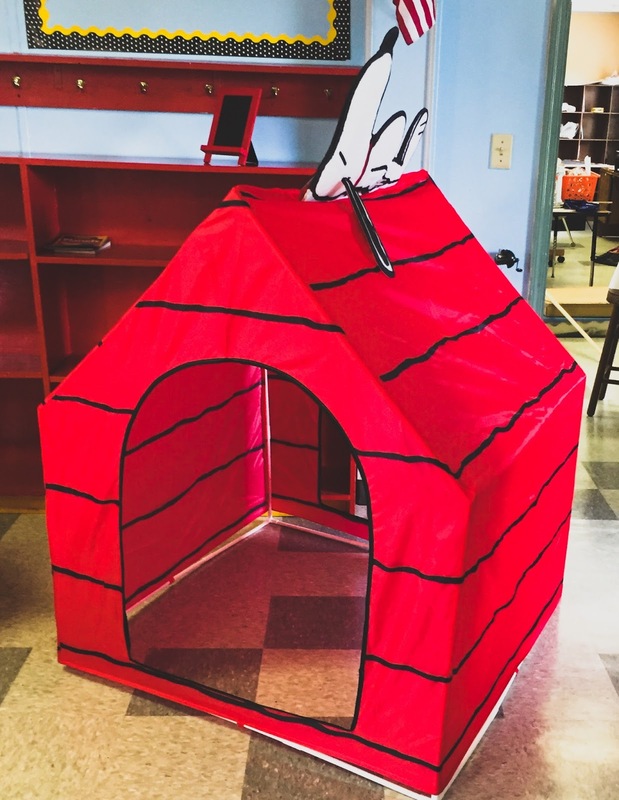 One student per class gets to make the doghouse his/her home base for the day. They are allowed to choose a friend to join them as long as they are not testing. Well, there it is! I hope you enjoyed this little peek into my room. 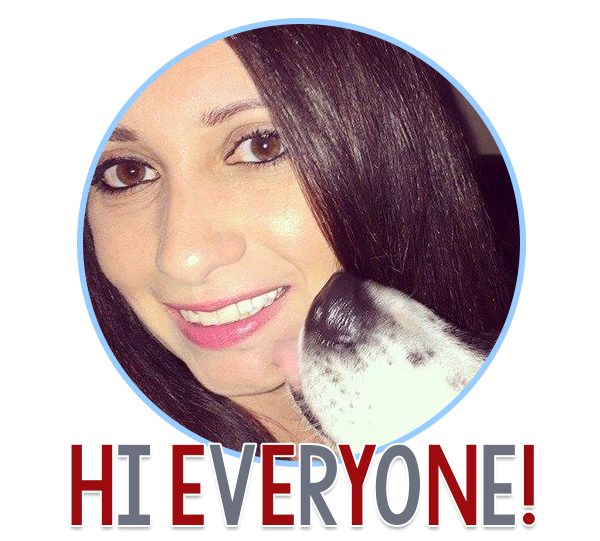 I'm always tweaking and adding things, so be sure to check back and see what I've changed!